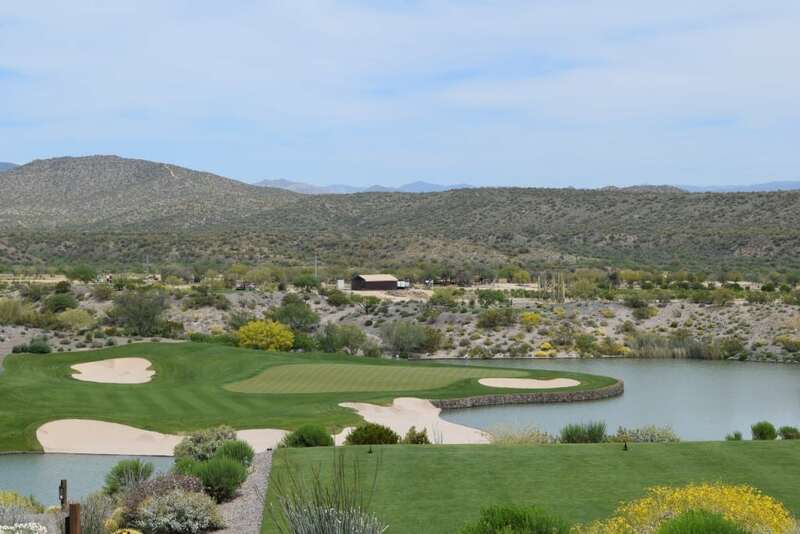 Big Wick as the 18-hole course at the Wickenburg Ranch Golf and Social Club is now referred to has matured nicely with greens that are receptive and smooth. 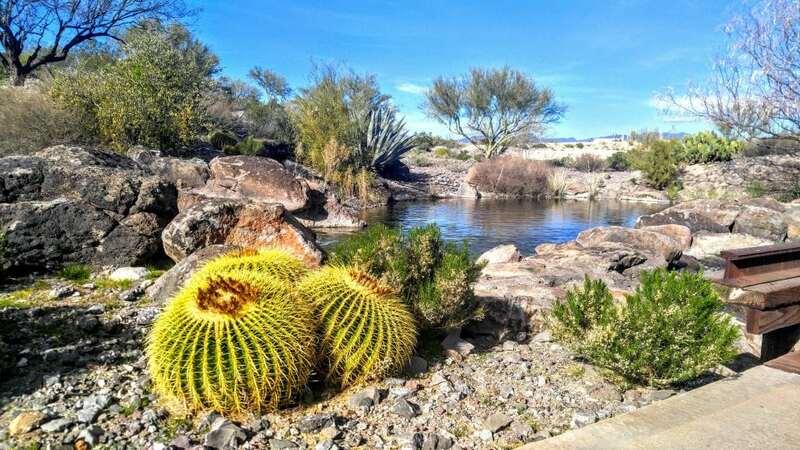 It has received accolades and awards from all since day one for the stunning desert vistas. 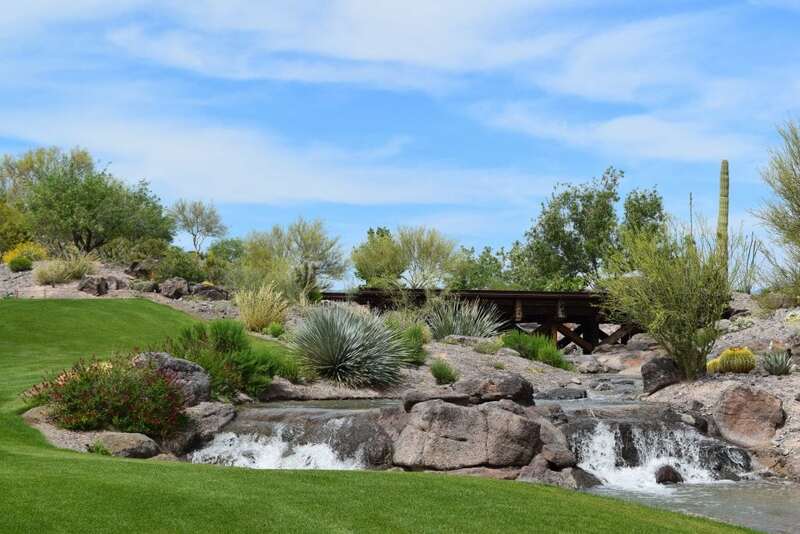 Hole number 14 has one of the best forward tee box views in the world with a series of waterfalls lapping below it feeding a stream flowing into a large lake leading to the green with Vulture’s Peak looming from the mountain range over the distant horizon. Progress has been steady with Trilogy in full construction mode building homes that do not detract from the beauty of the landscape. Metal and wood bridges seamlessly traverse over the washes and arroyos. From the iron gated ranch entrance with a windmill water tank to the spur and pistol tee box markers, the theme of the town is reflected. 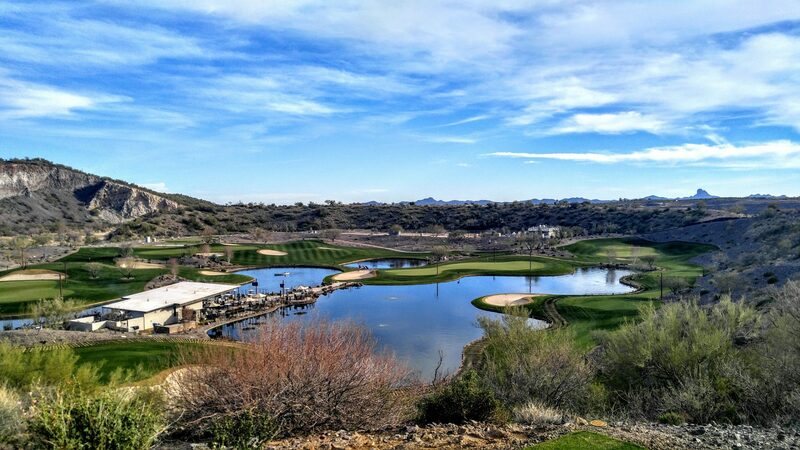 Wickenburg is known as “The roping capitol of the world.” The Wickenburg Ranch Golf and Social Club provides a luxury Good Life development that stands out while still fitting in. Now joining Big Wick, Li’l Wick has emerged as a nine-hole party playground for golfers and friends. Never have we referred to a golf course as adorable but it fits here. The Watering Hole is the nucleus of this nine-hole park, set on a peninsula of the waterway that connects several holes, which are lighted at night, as is the fire pit. Even when lit, the night sky is full of stars after a colorful sunset show. A full service bar and grill serves up tasty delights for patrons watching the golfers or sports on screens. Genius designers Wendell Pickett and Bill Brownlee have completed their vision to take the original driving range and create an entertainment oasis for members and guests alike. Li’l Wick is unlike any course in the world. Each of the nine holes has three tee boxes with distinguishable yardages and plenty of challenge and character connected by railroad tie paths fringed in between by grass. This is not your pitch and putt! Number 2 is a mountain climb for an elevated tee shot. If it tires you, rest a bit. Chill zones at all tee boxes feature lounge chairs here, a swing there and even a hammock for hanging out. There are no tee times, no dress code and guests have unlimited play for $25 a day. Speakers pump out music and a rowboat in the lake serves as a target for pitching floating balls. It’s all too cute. Members might take a stroll with their pooch and park on the porch. Doggies are not allowed on the course but, yes, well attended they may share the deck or they might prefer to race around Charlie’s Park Bonanza, which is the social dog park named after former owner, Merv Griffin’s dog. 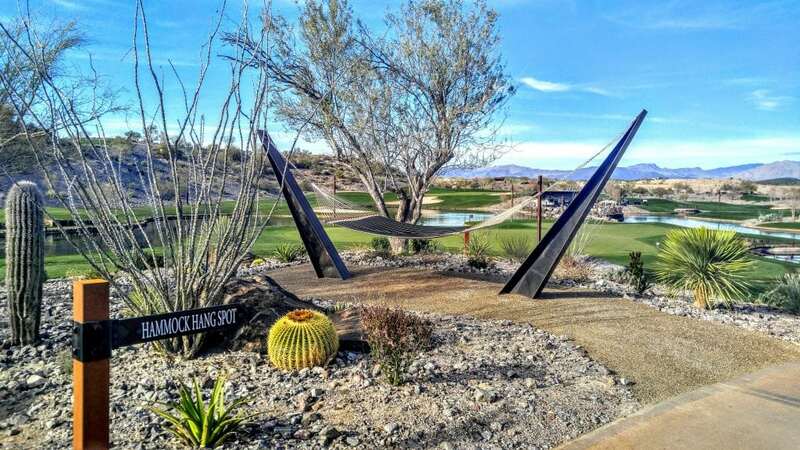 Wickenburg Ranch Golf and Social Club has something for all. Tennis courts are now complete alongside the driving range and next up will be the resort caliber club, which will be open for previewing this month. Over 40,000 square feet will be filled with state of the art fitness classes, culinary and creativity studios, restaurants, and bars. This truly is an amazing place whether you are looking for a second home or a community where you simply belong or to get away for a day on happy trails.